The city of Farmington is located in San Juan County in the northwestern corner of New Mexico. The city is situated on the Colorado Plateau and was founded at the confluence of three rivers: the San Juan River, Animas River, and La Plata River. 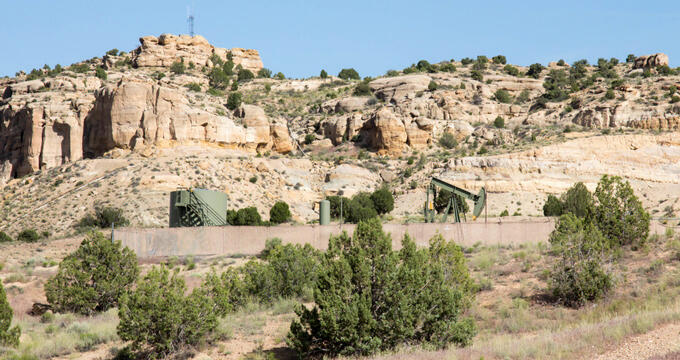 Farmington is the biggest city in San Juan County and is a key commercial hub not just for New Mexico, but for the surrounding 'Four Corners' region, which includes parts of Utah, Arizona, and Colorado. The land that would eventually become Farmington was inhabited by Native Americans like the Ancestral Puebloans many years ago. Some mining occurred in the region, but there weren't any serious settlements until the late 19th century. Farmington was founded due to its key location at the meeting point between three rivers and was originally called 'Junction City' before being incorporated as Farmington in 1901. A railroad linked the town to Durango, Colorado in 1905, which helped to boost the local population and economy. Natural gas, oil, coal, and petroleum became important parts of the city's industry over the years, with coal from the nearby mines being used to power the Four Corners Generating Station. As well as being a successful mining town, Farmington is also known under the nickname 'Baseball Town USA' due to the fact that it hosts a lot of baseball tournaments each year, including the Connie Mack World Series which pits ten teams of youngsters from around the US against each other. Other popular events and activities in Farmington, NM include fishing in the various rivers and lakes nearby, as well as golf and annual Riverfest events. Elevation is an important geographical statistic to consider when looking at any town, city, or other key location around the world. Elevation is most commonly measured and presented in feet or meters and has a variety of logistical uses, as well as having a strong effect on an area’s climate. The elevation of Farmington is 5,395 feet (1,644 m), which is very high compared to many other cities and towns around the United States, especially those in coastal regions which are usually situated at elevations lower than 500 feet (152 m). The average elevation in the United States is 2,500 feet (760 m), so Farmington’s elevation is over twice as high as the national average. The average elevation in the state of New Mexico, however, is 5,700 feet (1,740 m). So, when compared to the state average, Farmington is actually lower than many other locations around NM. New Mexico is actually the fourth highest overall in terms of elevation, trailing only Colorado, Wyoming, and Utah. The highest point in New Mexico is Wheeler Peak, which has an elevation of 13,167 feet (4013.3 m). The state's lowest point is the Red Bluff Reservoir, situated on the Texas-New Mexico border, which has an elevation of 2,844 feet (867 m). The highest city in all of New Mexico is Taos Ski Valley, a small ski resort town in Taos County, which has a base elevation of 9,207 feet (2,806 m) and can reach heights of up to 12,581 feet (3,835 m), with multiple homes being situated above 10,000 feet (3,048). Major cities around the state include the capital of Santa Fe, which has a high elevation of 7,199 feet (2,194 m), Albuquerque, which has an elevation of 5312 feet (1619 m) and Las Cruces, which has an elevation of 3,900 feet (1,200 m). The city of Farmington, NM has a semi-arid climate with hot summers and cold winters. Conditions are very dry in Farmington throughout much of the year, with less than an inch of rainfall in most months and only 8.6 inches in total over the course of a year. The city does, however, receive over 12 inches of snow in the winter on average. The coldest month of the year is January with average lows of 20°F (-7°C), while the warmest month is July with average highs of 90°F (32°C). As previously mentioned, a big reason why many people visit Farmington is for the various annual baseball events and tournaments. The Connie Mack World Series is the biggest event of the year and the local Farmington High School team has also been AAAA Baseball State Champions many times in recent years. If baseball isn't on your list of interests, fishing in the San Juan River, Animas River, Navajo Lake, and other bodies of water is also very popular at Farmington, and the annual Riverfest events offer food, fun, and music for all the family.